- The main hull is selfbailing. - The space between the seat and the steering pedals is easily adjustable. Children from 1 meter up to guys from 2 meters long can take the WindRider Tango out for some hours of fun. 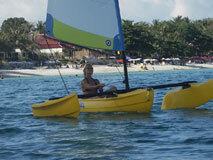 - The kick-up rudder makes it easy to launch the boat from any beach. - Installing and rigging the WindRider Tango takes less then 10 minutes and thanks to its very low weight it is easily transported on your car, caravan or motorhome. The innovative shape of the outerhulls make that the WindRider Tango is virtually capsize proof. Children that have never sailed before can take it out safely and most important, can return as well. The latest model even features a carbon fiber mast for improved performance! Like all WindRiders, the hulls and aluminium are protected by a bulletproof warranty. 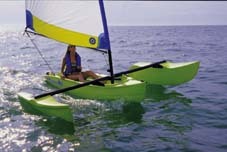 The WindRider Tango ensures a safe and sure way of fun on the water.